Yes, I know. To all the kind people out there who know me well, don't bother to remind me. I've heard the news. 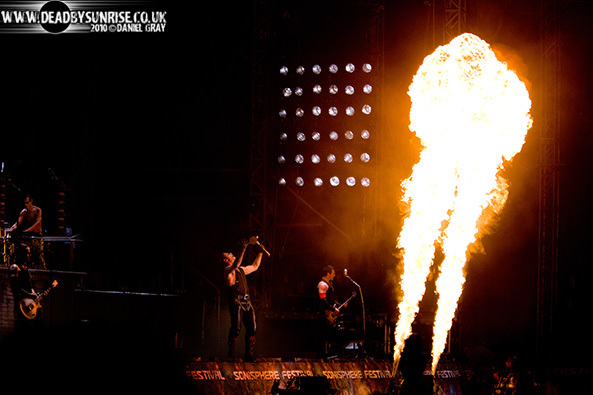 Rammstein is touring the United States for the first time in ten years. One of the songs on Liebe, "Frühling in Paris," has a chorus that is half in French. When I first heard Till sing "Oh non, rien de rien. Oh non, je ne regrette rien" ("Oh no, nothing at all. Oh no, I regret nothing") I thought it sounded familiar, but I couldn't place where I had heard those lines. Then the Literary Lab's Notes from Underground Anthology came out, and I read Anne R. Allen's contribution "The Golden Age," which references those very lines from a song popularized by French singer Edith Piaf in the 1960s. Fate conspired to teach me more about Edith Piaf last Wednesday morning, when the local library had baby time. Mr. G and I took our little bundle of joy on her first trip to the library and read her silly children's books about Saint Patrick's Day and Zen panda bears. Then we wandered past the DVD shelf and noticed a film about Edith Piaf's life, La Vie en Rose starring Marion Cotillard. We took it home and watched it while dancing, nursing, and rocking the baby. (We're becoming babytasking experts.) Cotillard gives an incredible performance worth seeing if you haven't. Anyway, it's a horrific, tragic rags-to-riches-and-addiction story. This poor woman had such a rough life that she ended up looking older than Nux Gallica's great-grandparents by the age of 40, and at the end of her life she still blew up the music charts with the song "Non, je ne regrette rien." Today, they begin with you. And it might sound crazy, but I realize that I would rather be here in my living room, dancing to a fifty-year-old recording with my baby in my arms than jumping a train to Chicago to see a German metal show with exploding dolls and flame throwers. No contest.